Click the link to jump to the Google My Business review email template download. 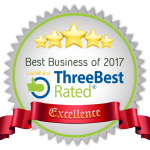 As well as being essential ranking signals for local SEO, online Google business reviews from clients and customers can be seen as one of the most powerful ways of promoting trust and confidence in your business. To highlight this, a recent survey from Zendesk found that 90% of respondents claimed that positive reviews affected their purchasing decisions, with 86% saying negative reviews were also an influence. In other words, reviews matter when it comes to attracting more customers and helping them to choose between your company and your competition. With Google dominating online search it makes sense that you put a lot of your focus into getting reviews on your Google My Business page. As an SEO company, the acquisition of online reviews is always a key part of our marketing campaigns. In this article, I want to look at why Google business reviews are so important and how to get your customers or clients to write and post them without breaking any of Google’s guidelines. Google My Business is effectively an updated version of what used to be Google Places for Business. By integrating this into the Google Plus platform, Google has allowed companies to manage the business information that appears in maps and search all in one place. With local search results, Google will often show a series of businesses in the area in what is known as the “local pack”. It is from here that your potential customers will see things like your address, phone number and of course reviews that people have written about you. Not only do reviews help you with your click-through rate but they can also help your business appear in the local pack in the first place. Although there are a host of sites you can (and should) look to get reviews on, with the majority of search traffic coming from Google it pays to focus your energies here, to begin with. Google has a lot of information on setting up and verifying your business, so if you haven’t done already you’ll need to do this. Once your business is set up on Google Plus, it’s time to start thinking about getting some reviews. As I mentioned earlier in the article. Internet users trust and are influenced by online reviews. So having an indication of the quality of your services in Google’s search result can be a powerful way to stand out from the crowd. Until recently Google’s Local Pack only displayed review stars once your business had received 5 reviews, this threshold was dropped earlier this year and it seems as though even businesses with just one review now show the review stars. Even more reason to start approaching clients to leave them. Don’t forget these stars have been shown to increase click-through-rate (CTR) by as much as 20%. These stars and an excerpt from the reviews also appear in the Knowledge Graph. Search for a company by name and if they’ve done a good job at collecting reviews you’ll see what I mean. The Knowledge Graph also now contains reviews from 3rd party sources, so don’t limit yourself to just Google reviews. We have seen in certain sectors that these review stars are being left out. We’re not sure why. Search on Google for the term “removals Bristol” and you’ll see the 3 pack without any review stars. Even though at least 2 of the businesses returned have way over 5 reviews. For the more technical amongst you, there’s also another option to consider. Structured Data. This is a standard set of code which helps you identify certain markup in a way that search engines can understand. This can help you to get reviews and stars for your products and services onto the organic search results themselves. Although don’t bother trying to get these to appear for when your homepage ranks…they won’t. It goes without saying that the most genuine and natural looking reviews are the ones that customers leave without any prompting. That’s not to say you can’t prompt someone into writing a review by asking them directly what they thought of your business and if they minded leaving a review. Far from incentivising, engaging with someone directly about their experience is actually good customer service and will often prompt a (hopefully) positive review on your Google My Business page. A quick note here about leaving Google Reviews. Your customers will need a Google account to be able to leave one. Many people do these days, either they’re a busy owner themselves and have one for their own Google Analytics or perhaps they have a personal Gmail account. If they don’t have an account they will need to create one. 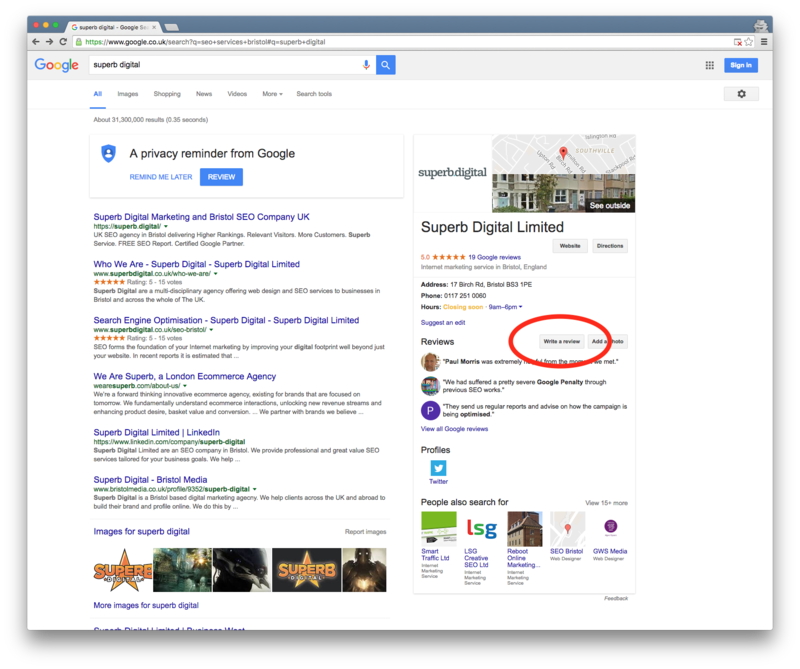 Read our step by step guide how to leave a Google review on any device. Of course, there are some steps you can take to make this an easier and more likely outcome. Basically, this comes down treading the line between not asking too early and not asking too late. Too early and your customer may not have got the full benefits of your product or service and may simply not have an opinion on it yet; too late and that initial sense of impressiveness you incited may have faded. This might sound like an obvious one but it’s amazing how many businesses fail to make it at all obvious how to leave a review. 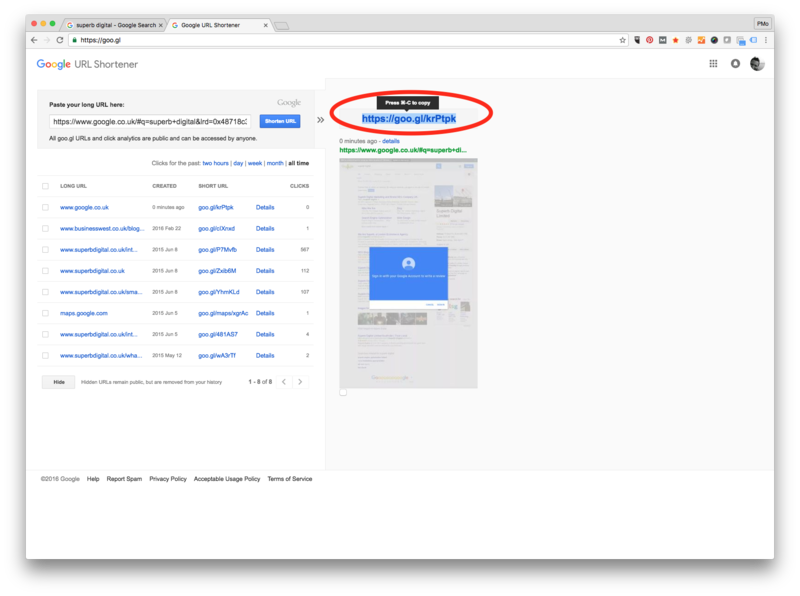 Your website and social media accounts shouldn’t just be encouraging people to leave feedback but actively showing them how by linking to it (we’ll talk more about how to link directly to your Google My Business page review form in a bit). If you have an email marketing campaign then you’re missing a huge opportunity by not utilising it to ask people for reviews. Ask people what they thought of your business or services and encourage them to write a review if they were impressed. 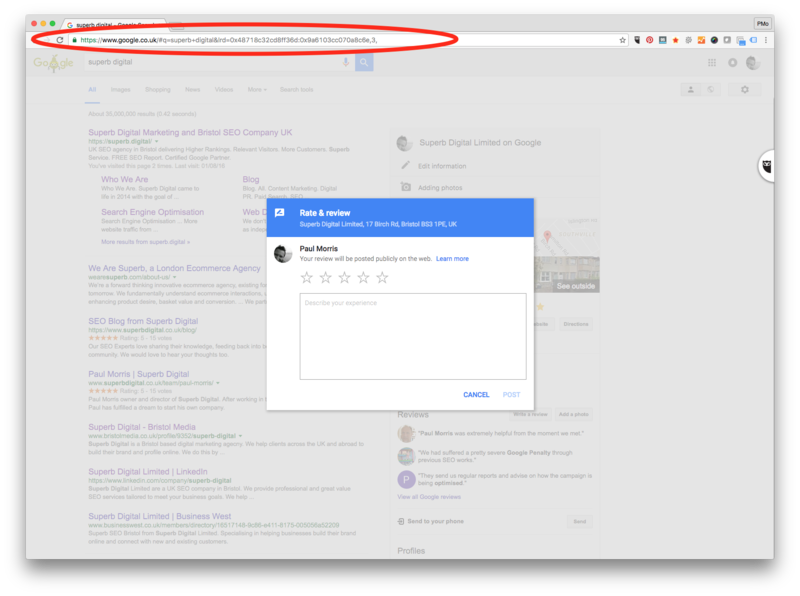 You could even incorporate a call to action (CTA) on your email auto signature with a link to your Google My Review page. Top Tip: If you’ve got a generic business name you may be hard to find. Add either part or all of your address to your search query and you’ll stand a better chance of showing the knowledge graph for your business. A nice touch I’ve seen a few people do is to shorten the URL so it’s a bit more user-friendly. Browse to your favourite URL shortening service. Here I’ve used Google’s own URL shortener, however, this service is being discontinued, so I’d recommend using https://bitly.com/. Copy and paste your long URL into the text box and click “shorten URL”. This will give you a URL such as https://goo.gl/krPtpk. Use the shorted URL on your website and in your email signature. You can even create a nice looking button with a “call to action” for people to click. 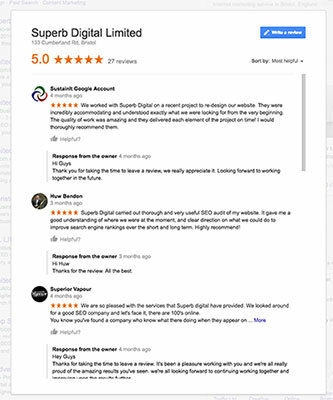 Our Customer Review Platform can help you get Genuine Customer Reviews to display on your website and increase your Google Reviews. 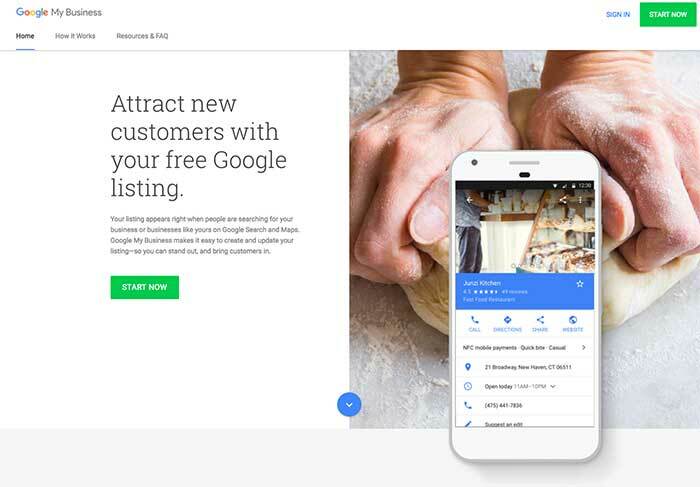 We’ve focused entirely on getting reviews on your Google My Business page in this article but that’s not to say you should ignore other review sites, just that Google should be your prime focus. There are a ton of review sites out there such as Yelp, Yahoo Local, Trip Advisor, Trust Link, Trust Pilot, FreeIndex and our local Bristol Online to name but a few, all go a long way in helping to build trust in your business, as well as supporting your local SEO efforts. Social media is also a huge area when it comes to getting endorsements. Whilst positive reviews on social media won’t have a direct effect on your local SEO, they will build trust in your business and encourage engagement which can lead to more reviews. Platforms like Facebook and even YouTube are great for getting public endorsements, whilst LinkedIn is perfect if you are a sole trader, allowing people to endorse you for key skills (you unfortunately, can’t leave reviews for companies or groups though). Don’t neglect your own website. By soliciting customer feedback directly and allowing them to leave reviews on your website you can quickly gain a large number of genuine comments. Using the structured markup we mentioned earlier this review data can be pulled out directly into the main organic search results. See Compton House of Fashion as a great example using our own in-house Customer Review Platform. If you rely on local search traffic to your website then you will, to a large extent, also rely on reviews. Whether we like it or not, the internet has allowed us to say what we think about any company or organisation. Whilst reviews can be a mixed bag and won’t always be entirely positive (learning how to respond to negative reviews warrants an entire article all of itself) they have become extremely important in the way they influence the purchasing and business decisions we make online every day. If you have any questions or experiences you’d like to share regarding Google My Business reviews, please leave a comment and we’ll reply ASAP. Really great article. I think there is still an under appreciation from sole traders and startups as to the real power of online reviews. With star ratings showing up in Google’s local pack it really should be a no-brainer for small businesses to be asking all their clients or customers to leave online reviews. Interesting to note though how Amazon recently took legal action over a number of of fake reviewers on its site. Do you think fake reviews could become a problem by undermining the authenticity of all online reviews? Thanks for your comment. Many businesses seem ‘too busy’ to ask their clients for reviews, even though their value is beyond doubt. Regarding fake reviews, this is a big problem. Most platforms try their best to ‘weed’ them out. To leave a Google My Business review for instance you need a Google account and platforms such as Yelp are so stringent in their efforts to only keep genuine reviews that there have been many complaints that real reviews are being removed. Ultimately if a company goes to great lengths to make it’s ‘fake’ reviews look genuine then there is little these platforms can do about it. Although for the effort required, surely it would just be easier to get genuine reviews in the first place. Leaving fake reviews, either positive for your own business or negative for a competitor’s business is illegal. There are now a growing number of cases both in the US and UK where regulators are taking action against those caught in the act https://www.gov.uk/government/publications/online-reviews-and-endorsements-advice-for-businesses/online-reviews-giving-consumers-the-full-picture. After getting a short url add in your email signature as Review Us link short url, it will work like a slow poison, don’t need to wait for bulk email. Great tip…adding the short URL to your email signature will really help those reviews come in. This was such perfect timing! Just had this discussion with my client during their SEO review – today! Thank you for the fantastic update! Thanks for your comments. Glad you found the article useful. It asks me to log in to my gmail – what if they don’y have a gmail account? Glad you found it useful. Happy review collecting! Hi. I’ve used this technique as a link on my website. It works great with desktops but mobiles don’t link to the review page. Is there a simple explanation for this? Hi Andy, this method only works on a desktop (or laptop). Shortening the URL isn’t necessary IF you send the reviews link via an email marketing campaign through MailChimp or Constant Contact, for example. Thanks, Emilio. Shortening the URL isn’t necessary at all really. We’ve recommended it so you can have a nice clean, short URL. Many of our customers hyperlink a button or graphic to link to their reviews page. That, of course, makes a lot of sense Paul! Actually short links DO have some conversion value beyond the analytics you get from using them.